Today — 5 November — is one of those periodic celebrations of failure we Brits so much enjoy, in this case the inability of Guy Fawkes to blow up Parliament on this day in 1605. For the four centuries since, the day has been celebrated with fireworks and bonfires. Northmore himself is an honest, vehement sort of a fellow who splutters out all his opinions like a fiz-gig, made of gunpowder not thoroughly dry, sudden and explosive, yet ever with a certain adhesive blubberliness of elocution. Letter from Samuel Taylor Coleridge to Thomas Poole, 16 Sep. 1799. 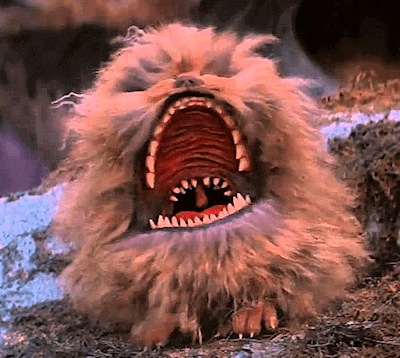 Not to be confused with the fizzgig, the friendly monster from the Jim Henson and Frank Oz film The Dark Crystal. Fizgig in the sense of the firework is now quite dead, as are most of the other senses that this weirdly catholic word has had. The original was a frivolous woman, fond of gadding about in search of pleasure — an alliterative-minded seventeenth-century man wrote of “Fis-gig, a flirt, a fickle .... foolish Female”. The word was built upon gig, another word that has had many meanings; Chaucer knew it as a fickle woman but Shakespeare considered it to be a child’s top. The first part of fizgig is obscure. It can’t be fizz, effervescence, because that came along much later, probably as an imitative sound. It may be the same word as the obsolete fise for a smelly fart. Two dolphins followed us this afternoon; we hooked one, and struck the other with the fizgig; but they both escaped us, and we saw them no more. Journal of a Voyage from London to Philadelphia, by Benjamin Franklin, 1726. This was sometimes perverted into fish-gig by popular etymology. It has no link with the other senses but derives from the Spanish word fisga for a harpoon. Without their allies — “the fizgigs,” the police seem powerless to trace the authors of the robberies which are now of such frequent occurrence. Victorian Express (Geraldton, WA), 15 Nov. 1882.